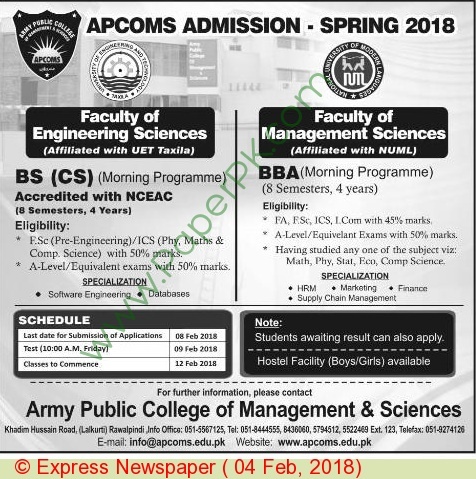 Admissions Open at Army Public College of Management & Sciences's Rawalpindi Campus for the batch Spring 2018. APCOMS offers admissions in different fields of study for Bachelors. you can apply for BS - Bachelor of Science, and BBA - Bachelor of Business Administration, , . University Address Army Public College of Management & Sciences, Khadim Hussain Road, Rawalpindi Cantt, Pakistan.